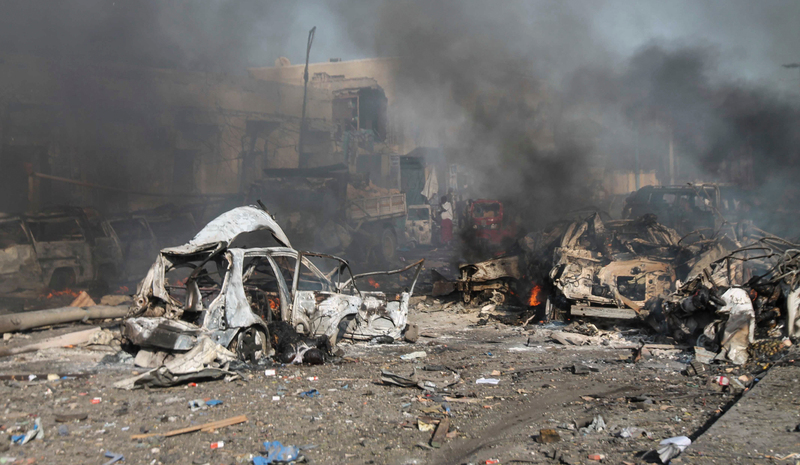 Could Somalia’s biggest terror attack in history see a turnaround in combating al-Shabaab? By Omar Mahmood and Gustavo de Carvalho for ISS TODAY. The attack in central Mogadishu on 14 October that killed more than 350 people has not drawn much attention from traditional or social media. Despite being the largest terror attack in Somali history, the now-common supportive hashtags disseminated globally after such deadly incidents – such as #PrayforMogadishu – are still not trending. Nevertheless, indications are that the scale of the attack by al-Shabaab could serve as a game changer for innovative conflict prevention in Somalia – both for local and international actors. The 14 October attack was far from surprising, despite the horrific death toll. Just two weeks later, al-Shabaab militants again assaulted Mogadishu, laying siege to a hotel and killing nearly 30 people. Since being pushed out of many urban centres after a series of offensives by the African Union Mission in Somalia (AMISOM) between 2012 and 2014, al-Shabaab has countered by engaging in asymmetric violence similar to the recent Mogadishu attacks. As a result, Somalia has become one of the countries most affected by terror attacks worldwide. Al-Shabaab has achieved success due to several factors. For example, the Somali security sector has struggled to contain the extremist group. Four top security officials have either resigned or been dismissed in the past month, while nascent efforts to develop a coherent national army are hindered by the fact that soldiers are rarely paid on time, if at all. But at its core, al-Shabaab has thrived because of deep-rooted structural factors. These include the constant divisions among political actors, and the challenge of extending government presence in rural areas after decades of state collapse (this is all the more pertinent given the need to compete with the services provided by al-Shabaab itself). This shows that al-Shabaab is more a symptom of the conditions conducive to conflict in Somalia than the cause. The public anger surrounding the 14 October attack will contribute to pressure to step up the military fight against al-Shabaab, which the Somali government has already promised to do. Yet such reactive responses limit the scope to deal proactively with complex longer-term causes of terrorism. Despite the entrenched risk factors in Somalia, and the immediate responses, it is worth considering whether the 14 October attack can in fact lead to local innovation in Somalia that sees more coordinated and unified conflict prevention efforts. The outpouring of anti-al-Shabaab sentiment after the attack indicates that the Somali public has already made its feelings known; Somali leadership should set aside their squabbles and unify around this objective. A failure to do so could mean that in the future the public’s wrath is directed more towards the country’s leaders than al-Shabaab. Genuine local conflict prevention efforts could include a greater focus on clan reconciliation, especially among minority clans. The grievances of potential spoilers left out by Somalia’s incipient federalisation system need to be addressed, to ensure al-Shabaab doesn’t target aggrieved parties for recruitment. On another front, the aftermath of the 14 October attack could also potentially alter international efforts to manage and prevent conflicts in Somalia. It may ultimately influence the nature of the withdrawal of AMISOM at a time when the mission is grappling with the specifics of its funding-induced drawdown. The current global climate and reduced European Union funding for AMISOM troop payments has signalled a degree of donor fatigue regarding Somalia, despite an outpouring of support after the deadly al-Shabaab attack. If such donor fatigue resumes after the shock of the attack wears off, the future of conflict prevention in Somalia may suffer. In a larger global and regional context, however, the attack occurred during a period when international actors, including the United Nations (UN) and AU, have put increasing emphasis on ensuring that conflict prevention is more effective. However, if conflict prevention is – as UN Secretary-General António Guterres often says – the priority for the international community, then it has to be more visible where it matters most. A renewed focus in Somalia would be an opportunity to put this talk into action. International actors must however steer away from an approach focused on the superficial assessment of emergencies. Conflict prevention in Somalia requires not only that the symptoms of the conflict are addressed, such as the attacks themselves, but that local partners are part of the effort to deal with its root causes, like a pervasive lack of governance. This ISS Today is a version of an article first published on the Conflict Prevention Innovation website, a partnership between the ISS and the ISS and the Igarapé Institute.